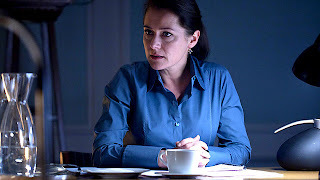 Back when Borgen started in the UK in January 2012 we wrote how it was good that the main character, Birgitte, had a stable family life - her relationship was fine thanks, and all the drama took place in her office, or in the tv studio, or on the way to the office or the tv studio. It felt quite fresh that the lead female character didn't have to 'sacrifice' her personal happiness in order to achieve professional success. Her biggest personal concern was banning biscuits in meetings. But what a difference a year makes. By the end of series one, Birgitte was prime minister of Denmark - in some complicated three-way coalition government or something, we don't quite know the details - but her husband - reliable, dependable university lecturer Philip - had moved out and Birgitte was struggling, no matter how many lamps or candles or cushions there were in their lovely home. Now, in series two, and a year on, they are divorced - something that Philip instigated and Birgitte reluctantly agreed to. He is dating Camille, who works at the hospital in Copenhagen, while Birgitte had a pain-covering drunken romp with her driver Kim, after he unblocked her kitchen sink, the romantic swine. The pressures of life as a prime minister, a divorcee and of being a mother, and then drunkenly sleeping with your driver, are all going to take its toll - but is marital strife a slightly obvious plot thread to pursue? Would it be the same if the prime minister in Borgen had been a man? And does it even matter anyway? The actual Danish prime minster, Helle Thorning-Schmidt, is happily married by the way, but take our own nearest real-life comparison: you can't quite imagine Margaret Thatcher during her time as PM getting frisky with her driver, perhaps after Denis had eloped with an NHS chiropractor called Julie. Margaret simply wouldn't have let it happen. So maybe it's just quite hard to believe Philip would have ended the marriage so easily, or that Birgitte would have let him.Or maybe - sniff - we just want Birgitte to be happy. IS THAT TOO MUCH TO ASK!? But dramatically speaking, Birgitte's emotional woe has given her somewhere new to go - and also stops the drama from getting too politics-heavy, even though the double-dealing and back stabbing (aka 'politics') has ramped up a notch this series. And it's not just Birgitte who's suffering in her home life: Kasper can't make up his mind about living with his girlfriend; Katrine is 31 and alone and now jobless, and Hanne's an alcoholic with a daughter who doesn't want to see her, so, really, emotional turmoil is happening everywhere - and it's what makes the drama more involving; seeing these characters both in and out of work and helping us connect with them. And it's just as well, really - it's still hard to believe that a show that's basically about a Danish coalition government, with scenes discussing welfare reform and policy, is quite the entertaining and absorbing success that it is. And if that ever runs out of steam, intrepid journalists Katrine and Hanne are a spin-off show waiting to happen, fighting injustice and crime in Copenhagen, always equipped with neck scarves of varying colour and size, like a Danish, um, Rosemary & Thyme. 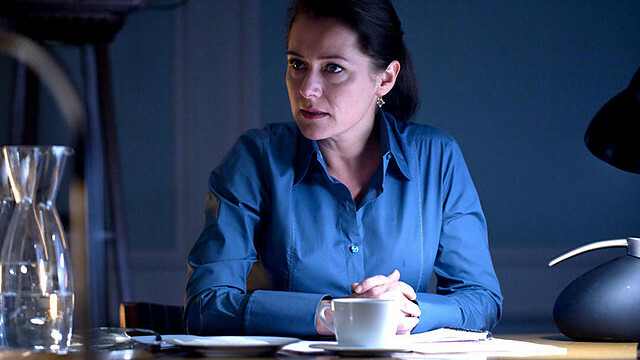 Borgen series 1: Episode 3 and 4 - The dramatic unexpectedness of Greenland. Greenland!